Huge amounts of time, money and effort have been poured into perfecting green office design, off the back of growing recognition of the positive impact such environments have on workers’ wellbeing. “Vertical gardens are being used increasingly more in office design, and it’s easy to see why,” says Richard Woods, commercial director at Evergreen Walls. “Gone are the days of the cramped and crowded office. Designers now are integrating flexible seating and group working zones, and greenery is being used to aid the efficiency and wellbeing of the working inhabitants. “These offices have wall spaces [that are] often barren and overlooked. Vertical gardens can make great use of these empty [walls] and are loved by the employees,” he says. Green walls have many of the benefits of a green roof, but with the added perk of using very little floor space. When used externally, they can protect a building from the harsh sun as the cavity between the green wall and the host wall will remain at a relatively constant temperature. Combined with the cooling effect of plants transpiring, this translates to less energy consumption due to lower air conditioning use. They can also help to reduce the Urban Heat Island Effect and offer acoustic benefits. Green walls act as a biofilter that capture and denature pollutants such as volatile organic compounds (VOC’s) and they can purify grey water by removing heavy metals. Green walls have an aesthetic appeal, lending a distinctive style to an office and, as mentioned, can create a sense of wellbeing. There are many different types of green wall systems. They either use a growing substrate or are hydroponic and their wall structures vary from modular to sheet or board-based, with felt pockets to support the plants. All types require irrigation, which often includes fertiliser. Green facades are created by growing plants up a building’s façade, either from garden beds at its base or by container planting installed at different levels on the building. It is vital to remember that when it comes to planting green walls, there is no one design that fits all. Each office environment poses a different set of challenges for green walls, dictating what will work, and what will not. In Australia, many architects opt to use large climbers trained up cables, which is a popular method that has proven successful in many cases. Another trend is the use of tufting plants, which is starting to emerge in many new developments. Green walls which consist of plants in individual pots have also been popular, but according to Arno King, ‎director at Arno King Landscape Architects they are “extremely high maintenance, lower longevity, prone to failure and require larger quantities of water”. The first step to approaching green walls is to consult a horticulturalist or landscape architectural consultant at the beginning of the project. “The single most important thing for an architect to consider is the limits of their expertise and to get an appropriate qualified and experienced consultant in to provide assistance at the start of the project - and not once the wall or the planting has failed,” King says. Compared to the popularity of vertical gardens overseas, they have had a slow uptake in Australia, which King attributed to “the failure of many initial installations which did not draw on the many decades of overseas experience and tried to ‘reinvent the wheel”. It is important for architects to consider that plants require adequate soil volumes, appropriate media, drainage, irrigation, lighting and air movement for their root systems in order to remain healthy. Understanding the maintenance required to ensure a living wall thrives and realistic and client-approved maintenance regimes need to be designed into the project at an early stage. Occasionally, the commercial practicalities of ongoing maintenance can be overlooked, particularly for façade green walls which may require maintenance at a height. Mark Paul, director at The Greenwall Company says that despite the popularity of vertical gardens in office design, he is still seeing finding that clients are opting to retrofit rather than include the green wall in the original design. “If the vertical garden was included in the original build, it would save the client time and money,” he says. Success of green walls depends on selecting plants that are appropriate to the green wall structure and the conditions. An analysis must be conducted on the light; air movement; air quality and humidity; traffic and potential for physical damage; and available maintenance. King said that while many plants in the Aroid family such as Philodendrons, Syngoniums, Epipremnums and Aglaonemas are popular and proven performers on green walls, they may not be suitable for many situations. Paul identified the main groups of plant types that are suitable for office vertical gardens as Ariods, Peperomias, Ferns, Bromeliads and Alcantareas. Edible green walls are also growing in popularity, including those containing basil, chillies, chives, oregano, thyme, mint and sage. Artificial plants are often a much cheaper alternative and come without the level of maintenance required for live plants. They are regularly touted as being more sustainable as they do not use resources such as water, they last longer and some are made from recycled materials. Artificial plants may provide the cognitive benefits of natural plants but their main purpose is aesthetics, so they lack the benefits of air filtering, removal of CO2 from the office environment and reducing the Urban Heat Island Effect. In certain conditions, green walls can grow edible plants, but this can be a challenge as most plants prefer gentle slopes, not vertical. Ian Lillington, owner of Living Permaculture and author of The Holistic Life – a Beginners’ Guide to Permaculture said the variation in sunlight of green walls is another issue for growing edible walls. East and west external faces of buildings experience very hot sun for at least three months of the year, south facing walls in the southern hemisphere are very cold in winter and sunless and north facing walls are extremely hot in summer. “There are very few plants that are naturally adapted to that environment,” Lillington explains. Although they can be useful, green walls don’t quite fit in with permaculture design principals. True permaculture should provide harmonious integration of environment and people. Lillington says the ideas around living walls, seem to “mostly be about trying to make a disaster into a slightly less bad disaster. Huge concrete offices, whether four or 40 storeys high are not sustainable; and almost all living walls are quite out-of-proportion to the original problem, i.e. the concrete and steel mass that does not accord with ecological design principles”. Axiom Workplaces’ client, Eftpos, wanted to incorporate nature into their new head office space in a way that would represent a focus on sustainability, inspire their team and act as a unique branding tool, but did not need to be maintained. The team was accustomed to working in a flexible environment but their culture had lost much of their collaboration. The client was eager to bring people together by incorporating natural design principles in the office. The designers, Axiom Workplaces, selected SMI National’s moss product, which is preserved real moss that comes in a range of colours and can be sculpted to suit design requirements. SMI National’s moss wall doesn’t need to be maintained or require lighting or water. The moss designs were applied to the wall, fixed between natural timber panels and made to look as though they were naturally growing down the surface. The moss wall achieves the aesthetic, cognitive and functional benefits of incorporating nature into a space, also reducing sound vibration and absorbing pollutants, without the required maintenance of most live green walls. PIA was looking to bring some nature indoors to their new office space without breaking the bank and with limited scope for maintenance. They wanted a solution which would make an impact on potential clients and make them feel at ease when they arrived at their office. PIA decided a green wall covering would complement the professional welcome given by the reception staff and chose to install over 25sqm of Evergreen Wall’s premium green wall panel, an artificial green wall solution. The Evergreen Panel was selected to add a natural look and feel and was chosen for its realism, variety and density. 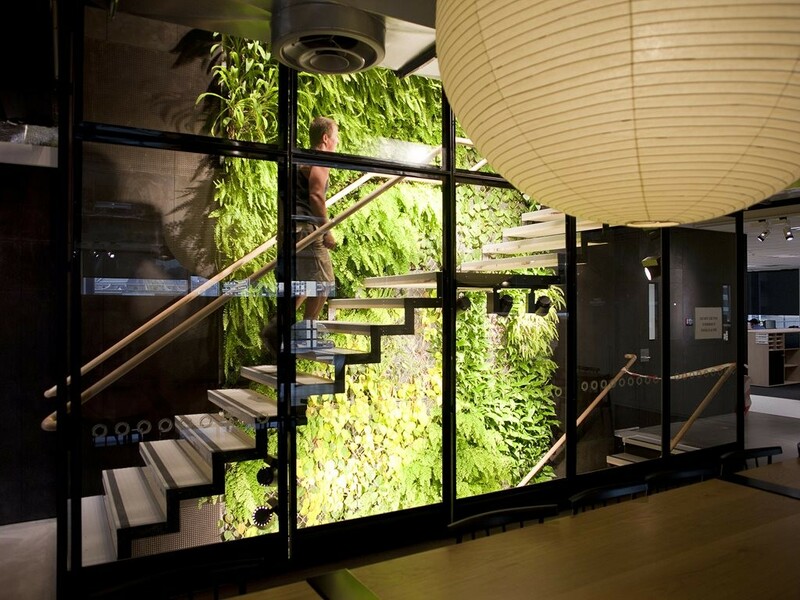 The Origin Head Office in Melbourne boasts the tallest green wall in the country, spanning 22 floors. Each floor has its own unique planting make up, designed to maximise varying angles and lighting. The Origin office is a refit of an existing building and aims to utilise best practice in sustainability and energy efficiency through the design and installation of a trigeneration plant. Mark Paul, horticulturalist and director of the Greenwall Company says the green walls “form a continuous green spine down the core of the building. A green lung and wild place to traverse while using the stairs between floors”. Group GSA wanted a distinctive statement piece which was synonymous with world-class design to greet their clients and visitors upon entering their offices. They chose an internal 28sqm green wall for the entrance foyer of their offices, and adjacent to internal timber stairs. As well as being a “living” piece of artwork, this green wall provides acoustic benefits, reduces the energy consumption of their offices, assists with insulation and increases air quality.